As Adam linked to yesterday, an “emergency” transit funding bill, SB 5457, survived the Senate Transportation Committee, which had been the chief obstacle to previous transit bills. PubliCola has a lot more on the bill’s prospects and how it might change before becoming law. I had a brief chat with Metro GM Kevin Desmond about the short and long term implications of the Senate bill. Although the long-term deficit is wider, the 2012-2013 shortfall has long been reported as about 400,000 service hours, or about $40m annually. That’s around a tenth of total service. Metro projects that concessions by the ATU and other unions late last year will save $9m this year, $13m in 2012, $14m in 2013, and $20m by 2015. A $20 license fee generates about $26m $28m a year. Assuming the bill passes and the County Council acts, that means that Metro will not face immediate pressure to cut service before 2014, unless fuel prices increase steeply or Congress does something bad. Afterwards, the funding gap widens further to $60m annually, just as the new revenue authority would expire. The payroll savings cut that to $40m, but that’s still a large cut. It also implies non-delivery of 360,000 hours of non-RapidRide, non-service partnership bus service that was promised in Transit Now but deferred due to the crisis. As Erica Barnett points out, Community Transit, Jefferson Transit*, and Sound Transit are the other agencies that don’t have any other taxing authority to solve their problems. The House version helps CT out but the Senate bill does not. 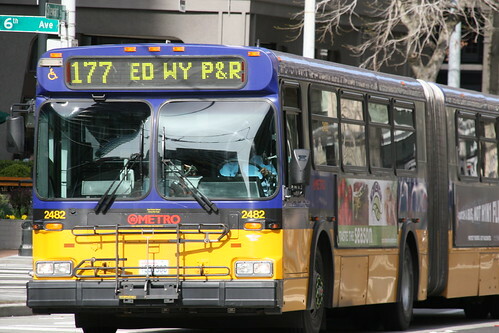 Still, this bill is likely to delay disaster in King County for two years, which gives everyone time to build a stronger legislative coalition to support bus service. * Jefferson just increased to the limit to solve their problems, so they shouldn’t need to go back to the well. I suppose we should not be holding our breath for the governor or legislature to come up with a plan to allow King County to raise a few hundred million dollars for downtown transit infrastructure, as per the tunnel agreement. I hope this band-aid — should it pass — doesn’t quench the apparent willingness Metro seemed to show in the RTTF report to start considering performance more seriously in allocating services. Even in the relatively-productive west subarea there are some routes that need to die, and a budget crisis could provide political cover for doing so. Martin, you might want to put into context that this seems to be the plan many folks want to see happen. The intent is to have “emergency” coverage for two years, with some permanent new funding mechanism(s), possibly voted upon by the people in 2012, which would pick up by 2014. I think you and regular readers know that, but I’m not sure your headline conveys that impression. And that many of us fear plots to tie transit funding and roads funding together into one package again. My concern is that Metro won’t be encouraged to restructure their service as they should. By Metro, you mean the KC Council, correct? I’ll bet staff are itching to to restructure service and trim less productive service. However, the Council and often the public as well are fairly resistant to change. I’m curious about what they’re projecting in terms of the return of sales tax revenue as the economy improves and what that means to their future planning. Does anyone have a sense of this? I find this statement to be alarming, and irresponsible by Mr. Desmond, if true. Metro began to realize it’s funding base was in trouble in 2008 (Times articles). Since then they have been reluctant to face this crisis head-on, and deal with it in a comprehensive way since the beginning. To date: various funds have now been cannibalized to save the existing service, an auditors process has been completed, a Task Force process has exhausted itself, and a Council still in denial, which has only exacerbated the problem. Waiting for the ‘Good Tax Ferry’ to sprinkle cash on the problem doesn’t solve anything. It only delays the inevitable – Metro must lower spending, while increasing revenues. Metro now faces holes so deep into the future that the brightest spotlights can’t see the bottom. Fuel will rise. Congress is broke. It will get worse. I raised the red flags on this years ago here, and was told to be patient. Well, it’s now three years down the road, and the crisis is just as bad or worse, and now Metro wants to kick the can down the road for another three years to 2014. Anybody want to guess what will happen then? I find your statement to be bizarre. Metro has cut costs deeply, and is taking advantage of nearly every revenue opportunity given it. They would have loved for the legislature to give it permanent authority. From 2007 to 2009 Metro increased hours from 3.4 to 3.6 million per year. Employees rose from 4361 to 4446. Riders were flat from 111 to 112 million. Sorry Martin, but I don’t see a bunch of trimming the operation to meet projected revenues anywhere. King County got its act together this year, which is why we got this bill past Haugen. But Pierce and Snohomish need it more and they were excluded. In fact only one Snohomish rep showed up at the Senate hearing, none from Pierce, while those of us from King made a very strong showing. It’s politics. Nevertheless some of us who represent people statewide will be trying to get the coverage extended to other agencies. We also want more tax options, especially less regressive ones. I even testified for a personal carbon allowance, just to get it on their radar. This would be ideal for long term funding, at least until fossil fuels run too low.